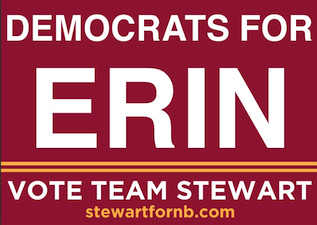 NB City Journal: Democrats For Erin! When an election takes place it is quite common to see a fight between Democrats and Republicans. This year is very different in the race for Mayor in New Britain as Republicans are not the only ones supporting Erin Stewart. Many high ranking Democrats have come forward to support her as well. Six Term Democratic Mayor William McNamara (1977-89) said he supports Stewart for various reasons. McNamara also emphasized that Stewart is a college graduate. O’Brien took courses at Central Connecticut State University, but never graduated from college. Peter O’Shana, a former Democratic Councilman, said he supports Stewart because he is upset with the way the present administration was run this year. “The property taxes should have been raised rather than bonding. When I was on the City council the mill rate was in the 50’s,” he said. “To try to keep the mill rate low for an election promise and get us more in debt by bonding makes no sense to me. It takes up your credit line and what if an emergency really comes up? Former Democratic Majority Leader on the Common Council Barbara Kirejczyk, is also supporting Stewart. Longtime Democrat and former committee member Daniel Salerno said he is running on the Republican ticket for several reasons. At least two other prominent Democrats said they support Stewart, but refused to give comments due to possible repercussions from the Democratic Party.